Continue on to see the full list of improvements found in this update. - In Play Now Online, the opponent’s uniform will now be displayed in the pre-game settings (to minimize uniform conflicts in games). - If two users pick the same color uniform for a Play Now Online game, the last user to select their uniform will have their uniform automatically changed to one of another color during loading. - Improved logic and visuals of “pulling the chair” in the post. - Fixed a case where certain stat combo performance incentives (e.g. 25 points and 12 rebounds) were not consistently rewarding the user with the correct amount of VC. - (Switch) Players will no longer appear without uniforms when they play a game in which the Ring Ceremony took place. - Fixed an issue where headphones would be removed when entering Ante-Up or using the Subway. - Users are now able to see other players’ headphones when viewing them in the Neighborhood. - End-of-game improvements to the Dodgeball experience. - Improved lighting quality inside the new Ante-Up daily spin room. - The VC amount should now always properly appear above the court when in the Ante-Up courts. - When playing a crew game, all users will properly appear in their crews uniform (i.e. will not appear as a mascot). - Fixed a disconnect issue that users were reporting during the Court Conquerors events. - (Switch) Fixed an issue where areas of the walls would lack collision in the new Ante-Up prize wheel room. Make sure to visit location daily to get in your free spins for prizes! - Users will no longer be required to finish out games against all AI players when the opposing team forfeits by leaving the game. - Added the ability for users to view what Moments cards are currently available in Heat Check and League Moments packs (press ‘Y’/Triangle button when viewing those packs in the Pack Market). - Cards will now visually show their new, upgraded gem levels when a Duo boost bumps them up over a threshold. - Addressed a pause glitch that allowed some users to pause a Triple Threat Online game indefinitely. - Fixed an issue where the proper Heat Check attribute/overall rating boosts would not display upon visiting the Lineups menu. - Head-to-Head game types (Play With Friends, Unlimited) should now use default free throw difficulty settings rather than the global settings of one of the users involved in the game. - Improved server stability and performance in MyLEAGUE Online. 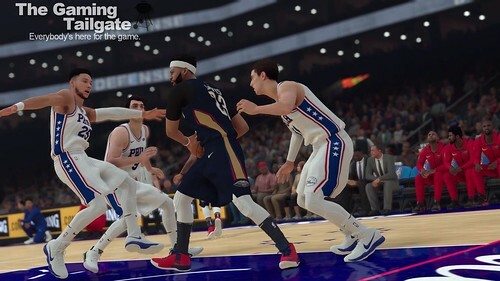 - Gameplay-related Rule Changes (voted on in the offseason League Meetings) should now properly take effect during head-to-head games in MyLEAGUE Online. - Fixed a hang that some users would see down the line after previously importing a player’s appearance using Player DNA. If you previously encountered this issue, your save should now be retroactively corrected.